In contrast to the usual answers concerning what the Good News might be, incendiary philosopher-theologian Peter Rollins suggests an alternative, radical definition: you can't be satisfied, life is difficult, and you don't know the secret. 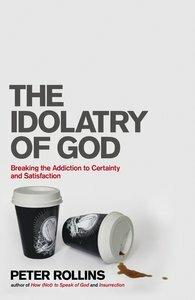 Arguing that God has traditionally been thought of as a type of product that will make you whole, remove your suffering and give you the truth, Rollins contrasts this with an approach to faith that invites us to embrace suffering, face up to our unknowing and fully accept the difficulties of existence. About "The Idolatry of God"
Peter Rollins (Ph.D., Queen's University, Belfast dealing with post-secular religious theory) is a writer, public speaker, lecturer and co-ordinator of the experimental collective Ikon (www.ikon.org.uk). Together these diverse activities ensure that I have the privilege of engaging in that difficult job of marrying activism with theory, the public square with the academy. He is the author of How (Not) to Speak of God: Marks of the Emerging Church, The Fidelity of Betrayal: Towards a Church Beyond Belief and The Orthodox Heretic and Other Impossible Tales.